With the seaside Château de La Napoule near Cannes, France, as your home base, spend a week immersed in exceptional gardens during a provocative and informative workshop on design and stewardship. The Château de La Napoule is an historic museum and vibrant arts center perched on the Côte d'Azur and set within a majestic compound that was restored more than a century ago by a pair of American artists; it is now the serene setting for residencies, workshops, and exhibitions. It’s also your home base for excursions to such famous destinations as Cannes, Antibes, and Saint-Jean-Cap-Ferrat. Course leaders Charles A. Birnbaum, president & CEO of The Cultural Landscape Foundation (TCLF), and Eric Groft, principal at Oehme, van Sweden, both recognized experts in the field of landscape architecture, will provide an in-depth look at landscape heritage through a combination of richly illustrated lectures, tours of iconic gardens, and opportunities to accomplish first-hand documentation of cultural landscapes in the La Napoule/Cannes region. On Friday, July 19, arrive at the Château for a wine-and-cheese reception followed by dinner. Saturday, the 20th, begins with breakfast, a tour of the Château, its gardens and beaches, and the first of five talks to be given over the course of the week. On Sunday, the 21st, the next talk features an introduction to TCLF’s profusely illustrated and carefully vetted What's Out There database of landscapes to understand how landscapes are classified, followed by opportunities to apply these classifications to parks, beaches, and gardens in the area. On Monday, July 22, we’ll spend part of the day in Saint-Jean-Cap-Ferrat at the Villa Ephrussi de Rothschild, which features a rose-colored villa on an isthmus overlooking the Mediterranean. The gardens are classified by the French Ministry of Culture as one of the Notable Gardens of France. Following lunch on the villa terrace, we’ll tour Villa Kerylos, built on the tip of Baie des Fourmis at Beaulieu-sur-Mer and surrounded by water on three sides. On Tuesday the 23rd we’ll visit Jardin de la Louve Botanical Garden, another Notable Garden of France. It’s a private French contemporary garden, open to the public, in the town of Bonnieux and was created beginning in 1986 by Nicole de Vésian, textile designer for the Paris fashion house of Hermès. Wednesday, July 24, includes a tour of La Pomme d'Ambre, which contains examples of all the plants of the Provençal culture: rosebushes, wisteria, cistus of the nearby maquis, and collections of exotic sage. However, with more than 700 species, the garden has the typical informal exuberance that characterizes cottage gardening. The day continues with Eric Groft talking about ‘designing with nature’ and about the strategies and approaches for planting design. 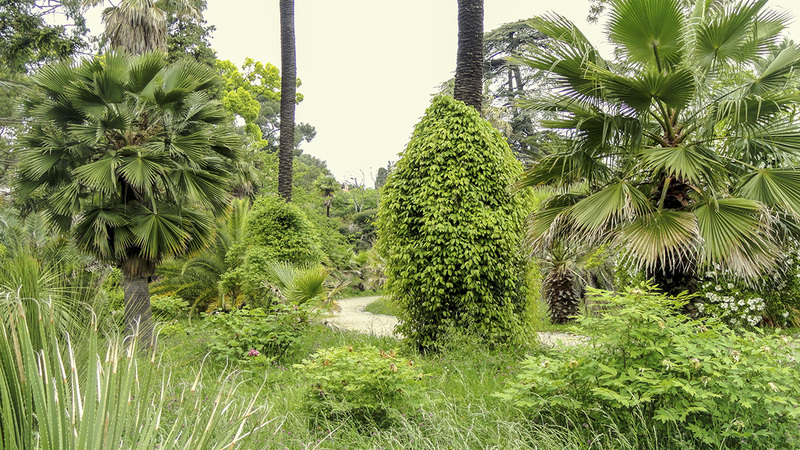 On Thursday the 25th we’ll journey to Antibes to see the Villa Thuret Botanical Garden. The garden contains approximately 2,500 trees and shrubs in its collections, representing some 1,600 exotic species (144 genera, 131 families) from Mediterranean or hot-climate countries, including South Africa, Australia, California, Chile, and Mexico, as well as China, Japan, and New Zealand. From 50 to 100 new species are planted each year. The day will conclude with a discussion by Eric Groft about how landscapes evolve through a succession of owners, landscape architects, and lifestyles. Our final full day will be spent at the Château and includes a discussion by Charles Birnbaum about the treatment of cultural landscapes. He and Groft will then facilitate a group exercise on mental mapping. Following lunch at the Château, the group will review the What’s Out There landscape classification exercises introduced at the beginning of the week. The day concludes with a farewell wine-and-cheese reception and dinner. The Château de La Napoule is located in the historic fishing village of La Napoule. A popular summertime vacation destination, the town’s beaches and its proximity to nearby cultural attractions draw tourists from around the globe. The Château sits on the Riviera between Nice and San Tropez, just five miles west of Cannes. Museums, perfumeries, perched villages and historic chateaus and gardens abound in the region. Bus or van trips can be arranged for large groups and individual car rentals are available at the airport. Guests also often partake in boat rides to the islands off the coast and train trips to Italy, Monaco, Aix-en-Provence and Marseilles. Registration includes lodging, daily breakfast, and 'round-trip transportation to each of the gardens. The cost to register includes tour leadership. For pricing, registration, and additional information contact Tonya Quinn: Tonya@clews.org. LA CES™ professional development hours will be available to attendees, upon approval of the workshop. *NOTE: the schedule and off-site visits may be subject to change.